A latent Inhuman named Ash Minnick whose transformation occurred when the Terrigen Cloud floated over the continent of Australia. Not much of the young woman’s life prior to Terrigenesis has been revealed. 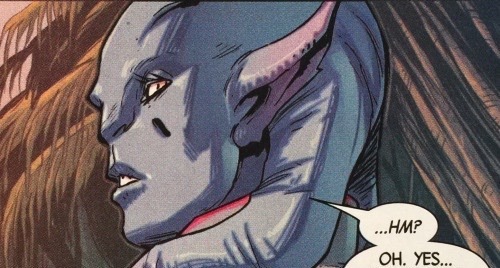 The transformation caused her to change form into a humanoid with light blue skin, pointed ears, and a pair of tendril-like protrusions extending from the back of her hairless head. Ash gained the ability to heal complicated wounds and sicknesses simply by laying her hands on the afflicted individual. The full extent of these healing powers has yet to be revealed, but initial indications suggest that the abilities are quite profound. The nature of her powers led to her being offered the new Inhuman name ‘Panacea’ after the ancient Greek goddess of universal remedy. Along with imbuing the young woman with the ability to heal, Terrigenesis also seems to have inhibited her ability to feel things on an emotional level. Her affect appears to be entirely muted and her experiences, whether they be positive or negative, does not provoke any kind of emotional response. What has caused this flattened affect remains unclear… it may be a byproduct of her physiological transformation, or could be a psychological reaction to the massive changes that have occurred in her life. Shortly after her transformation, Ash was abducted by a group of human supremacists who sought to publicly execute her as a show of fighting back in the face the influx of new Inhumans. She was rescued by Crystal and Naja and offered sanctuary aboard the R.I.V. Panacea has since agreed to help her fellow Inhumans as a member of Crystal’s Inhuman ambassadorial team. On her first mission, Panacea diagnosed acute radiation poisoning among a group of villagers living in a rural area of the sovereign nation of Sin-Cong. Panacea was able to heal many of these villagers, but commented that doing so was of little use unless the villagers were relocated due to the massive toxicity that has effected the entire area. On this same mission, Panacea encountered a group of victims who had been severely mutated as part of the evil Commissar’s effort to create super-soldiers. Panacea was able to reverse the mutations in two of the three subjects, but the third was too far gone for the process to be reversed. He was in dire agony and Panacea caused him to die from a cerebral hematoma so to alleviate his suffering. Panacea’s teammate, Grid, was aghast at the cold manner in which Panacea had euthanized this man. Following this mission, Panacea has remained aboard The RIV and has spent much time with Gorgon. Gorgon had previously been paralyzed by a severe spinal injury and has been confided to a wheelchair. Panacea appears to be somewhat fascinated by Gorgon’s condition. It appears that she may be trying to heal his wound and whether or not she can or will succeed in doing so remains to be seen. An Inhuman who had the ability to generate pulsing energy about his fist, greatly enhancing his capacity to inflict damage in hand-to-hand combat. Payne had been assigned to a faction of The Royal Guard that patrol the perimeter of Attilan when the city was located on the blue area of the moon. Payne perished in battle against a squad of enhanced Kree soldiers who were attempting to lay siege of the city. These Kree were eventually repelled by Black Bolt. An Inhuman champion of the secret citadel of Utolan. Terrigenesis has endowed Passcode with the power of techno-empathy, the ability to mentally interface with and control electronic machinery. Passcode was recruited into a secret plot by his fellow Inhumans, Ikelli and Sanara, to expose all of Utolan to the Terrigen Cloud (even though doing so would likely cause the deaths of half or more of the populace). This scheme was eventually foiled by the All New Inhuman team with the assistance of Ana Kravinoff. Passcode and his coconspirators were defeated. His current status and whereabouts remain unrevealed but it is assumed that he continues to reside in Utolan. King Perrus. An Inhuman lord who ruled Attilan in the Third Century BC. Peruse was advised by his minister, Kovad, who was a distant relative of the present day Inhuman, Lineage, and an aspect of Kovad’s consciousness still remains trapped within Lineage. The young son of Gorgon (it has remained unspecified who Petras’ mother is). Petras was just a boy during the Infinity Event when Attilan was attacked by Thanos’ forces. In an effort to better protect his son and give him a greater fighting chance, Gorgon chose to have Petras undergo Terrigenesis prematurely. Inhumans typically go through Terrigenesis during mid-adolescence. Petras was a few years off from this age, but Gorgon was desperate and he subjected Petras to the mists despite the risks. The premature Terrigenesis transformed Petras into a minotaur-like being, with the body of a boy and the head of a bison. This transformation likely endowed Petras with enhanced strength and power, but also significantly mutated his physical him. It is possible that, had Gorgon been able to wait until his son was of proper age to undergo Terrigenesis, the results would have been different… he may have ended up more like his father, endowed with great powers while maintaining a relatively more human-like physical appearance. Petras escaped Attilan with the other Inhumans through Eldrac and his whereabouts remained unknown for a long while (much to his father’s distress). Later, it was revealed that Petras had been located in Australia and has been residing on the Royal Inhumans Vessel (RIV). It turned out that the natural maturation coupled with the premature exposure to Terrigenesis has caused further mutation in Petras. The youth was in dire shape and required a specialized stasis chamber to maintain vital functions. Fortunately, Panacea was ultimately able to help Petras and stabilize his condition. An Inhuman who lived many centuries ago during the time that the city of Attilan was first founded and built. Phadron sought to be the ruler of the new city of Attilan and he challenged King Myron for the throne. Myron prevailed and Phadron was subsequently banished from Attilan. Phadron’s wife, Rhaya, ands their infant son, Tuk, opted to join Phadron in his exile. Sadly, both Phadron and his wife were killed by carnivorous animals. Young Tuk was left for death, but he was taken in by a grouping of kindly cavemen. Tuk went on to have many adventures in this prehistoric landscape. Tuk’s Tarzan-esq exploits were told as a backstory features in issues of the original run of Captain America. His origin was later ret-conned to included his and his parents’ connection to Attilan and the Inhumans. An Inhuman whose infant child who was accidentally exposed prematurely to the Terrigen Mists. This caused the baby to develop Inhuman powers that established a psychic connection to the earth. The child’s cries of hunger or discomfort resulted in earthquakes and may have ultimately led to great catastrophe had it not been for the timely intervention of the superhero team, Alpha Flight. Heather Hudson of Alpha Flight devised a dampening device that quelled the child’s power until she could come to an age to gain greater mastery over them. Phadros and his child’s current whereabouts remain unknown. An Inhuman scientist and former high-ranking member of Genetic Council. Phaeder defied the laws forbidding experimentation with cloning. He was found out and striped of his seat on the council. Black Bolt’s father, Agon, was the chancellor who discovered Phaeder’s transgression as well as the one who called for his being expelled from the council (a matter that Phaeder would not soon forgive). Phaeder chose to leave Attilan. Before he left, however, he created a clone of himself and used the body to stage a suicide and cause his fellow Inhumans to believe he was dead. Phaeder went on to travel the world. At some point he came across the human geneticist, Herbert Wyndham, the man who would one day become the being known as The High Evolutionary. At the time, Wyndham was struggling to decipher the human genetic code. Such matters were rudimentary to Inhuman science, but Phaeder saw potential in Wyndham. He decided to give Wyndham a set of papers that entailed a complete decoding of the human genome. As The High Evolutionary, Wyndham would go on to use this information to augment his experiments and successfully developed a serum dubbed ‘Isotope A’. Phaeder later sought out the secret location of the subterranean nation of Lemuria, the home of The Deviants, a mutant race created by The Celestials millennia ago. The scientific guidance Phaeder was able to offer these people won Phaeder favor with the Deviant king, Lord Toad, and he was allowed to live among the Deviants as one of their own. Although Phaeder was forbidden to take a Deviant wife, he fell in love with a Deviant woman name Morga and the two secretly had a son together whom they named Maelstrom. Phaeder was able to pass-off his son’s presence by claiming he was merely a younger clone of himself. Phaeder and Maelstrom worked tirelessly together to perfect the cloning process, utilizing cloned bodies to maintain Phaeder’s youth and vitality. Growing into young adulthood, Maelstrom secretly took a Deviant lover. Unbeknownst to Maelstrom, this woman became pregnant with his child… a matter she kept secret from him (this child would later grow up to be known as Ransak the Reject, who would have many adventures alongside The Eternals). Eventually, Maelstrom’s parentage was discovered by The Deviants. Morga was put to death for her transgression and Phaeder and his son were banished from Lemuria. It was at this time that Phaeder discovered that The Inhumans had relocated the city of Attilan from off the Coast of Iceland to a secret local in Tibet. Phaeder sought out the remnants of Attilan’s former location and there he discovered a forgotten cache of Terrigin Crystals. Phaeder used these crystals to expose his son to Terrigenesis, imbuing Maestrom was terrific powers. Working from their new based among the ruins of old Attilan, Phaeder and his son began devising a plot to extract revenge on The Inhumans. They utilized cloning, genetic manipulation and the Terrigin mists to create a trio of Inhuman minions to do their bidding. All the while, Phaeder continued to use cloned bodies so to maintain his youth. A lab accident restricted Phaeder’s ability to transfer his consciousness into a cloned body and his health and vigor began to diminish rapidly. Maelstrom worked feverishly to complete their plans for revenge against Attilan in time for his father to see it to fruition. This plot, however, was discovered by The Inhumans, Gorgon and Karnak, and together with Black Bolt and The Thing from the Fantastic Four, they were able to put an end to the threat. A decrepit Phaeder passed away quietly with the disappointment of his schemes having resulted in failure. One of Maelstrom’s minions, Phobos is actually a clone of human exposed to the mutagenic properties of the Terrigen Mists. Phobos possesses a specific type of telepathy that enables him to instill intense feelings of irrational fear in those around him. Phobos and his fellow minions invaded the scientific labs of Hydro-Base in an effort to steal a mutagenic nullifying agent that the scientists there had created. Phobos and the minions battled The Thing of The Fantastic Four as well as the hero, Stingray. The two heroes won out and Phobos and his comrades were defeated and put in restraints. Upon learning of his minions’ failure, Maelstrom sent out his other servant, Deathurge, to silence them. Deathurge succeeded in his assignment and Phobos and the other minions were killed. As soon as Phobos died, a new clone of the Inhuman was immediately created. Phobos has perished in battle and been re-cloned in this manner on several occasions. His current whereabouts remain unknown. An Inhuman with purple skin and slightly equine features. Pinyon has the ability to fly, although it appears that he uses a specialized glider-suite to assist him (it’s not clear if this is indeed a suit or if it’s actually part of his physique). Pinyon was a member of the Royal Guard assigned to patrol the skies above Attilan when the city was located in the remote mountain range of the Himalayas. Pinyon and his comrades came across The Human Torch of the Fantastic Four when the young hero was attempting to approach Attilan without permission. The Torch battled the flying Inhumans until Pinyon fired off a lucky shot that dosed The Torch’s flame, allowing him to be captured. Pinyon’s current status and whereabout remain unknown. A fish-like and a citizen of old Attilan. Also known as ‘Metallic Titan,’ Prax Ord is a Centaurian and member of the Universal Inhumans (one of a number of different alien species whom the Kree had subjected to the same Terrigenic experiments as Earth’s Inhumans). As part of a Celestial Prophecy, the regents of these diverse cosmic Inhumans came together and chose Black Bolt of Attilan as their king and leader. As a member of The Light Brigade (a group of warriors made up of Universal Inhumans), Prax Ord and his comrades among The Light Brigade were sentenced to be sacrificed, an offering to the cosmic gods meant to anoint the creation of the Court of The Universal Inhumans. The Light Brigade stepped through the portal of Eldrac. Rather than sending them to oblivion, Eldrac chose to spare The Light Brigade and instead transported them to the Negative Zone. While in the Negative Zone, Prax and The Light Brigade were captured by the then lord of The Negative Zone, Annihilus. Prax and his fellow comrades were forced to fight in the gladiatorial arena against the Arthrosian champions. Prax and his colleagues were killed numerous times in the arena and each time, Annihilus used his Cosmic Control Rod to resurrect them so that they might fight, and die, again. Prax Ord possesses super strength and the ability to transform parts of his skin into a super-hard alloy. Following the disbanding of the Court of the Universal Inhumans, Prax Ord returned with his queen to the Centaurian home world. An Inhuman who possessed telepathic abilities. He was a second cousin to Medusa and Crystal and was recruited into Apocalypse’s group of assassins, The Dark Riders. Psynapse was killed when he attempted to tap into the telepathic powers of the mutant, X-Man (Nate Grey). The psychic feedback caused a release of energies that incinerated him. A cloned or in fashion resurrected Psynapes recently returned in the pages of Uncanny Inhumans once again as a member of the Dark Riders. This time the Riders were targeting Mutants with healing powers under the twisted auspicious that healing powers interferes with the mandate of survival of the fittest. Psynapses and the other Drak Riders were apparently killed when Magneto set a trap for them among the ruins of Geonosha. An Inhuman of the society of Utolan (a secret Inhuman city-state hidden in the Chimanimani Mountains of Mozambique). Puppeteer was one of the few ‘champions’ of Utolan, those selected to go through Terrigenesis. The transformative mists endowed Puppeteer with the ability to take over functional control of the body of another within his proximity. Puppeteer was involved in a coop engineered by his fellow champion, Ikelli, and Sanara. On Ikelli’s behest, Puppeteer took control of Flint’s will and forced him o use his own powers to create a great issue in the mountainside, thus exposing the city of Utolan just as the Terrigen Cloud was approaching. Fortunately, Flint was able to break free from this control and the other members of the All New Inhumans team arrived in time to save the citizens of Utolan. What became of Puppeteer, his current status and whereabouts remain unrevealed. One evening Benjamin Grimm, the ever-loivin’ Thing of the Fantastic Four, spotted the super villain known as Kraven the Hunter as he was tracking a pray through an abandoned warhorse. The Thing intervened, scared Kraven off and discovered the prey had been a mammoth dog. Although quite large, it quickly became evident that this dog was still just a puppy and an exceptionally friendly one at that. At the time, The Thing’s godson, Franklin Richards, was going through a very difficult time having cultivated a great fear of monsters. The Thing had the bright idea to bring this puppy to Franklin as a present and a means of helping the youngster feel more protected and less afraid of monsters. Franklin and this pup got along famously and Franklin decided to name him ‘Puppy’ (not an especially creative name). Franklin’s father, Reed Richards, noticed the distinctive pronged gif atop Puppy’s head and correctly ascertained that the dog must have originated from Attilan. There was some suggestion that Puppy is Lockjaw’s son, but that matter was never confirmed nor dispelled. Reed felt it best that Puppy return to Attilan, but Franklin had become so attached to the dog that separating them would break his heart; hence it was determined that Puppy could stay. Some time later, it was revealed that Puppy (akin to Lockjaw) possessed the ability to teleport himself and other over vast distances, even into other dimensions. Puppy had numerous adventures alongside the Fantastic Four. What eventually became of Puppy remains unrevealed. The Fantastic Four moved from Pier Four back to a newly renovated Baxter Building, a new writer took over writing the series, and Puppy was essentially forgotten about. It is possible that Puppet returned to Attilan, or perhaps Puppy accompanied the alternate reality version of Valeria Von Doom back to Earth-99135. An Inhuman child who underwent Terrigenesis at a very young age. The nature of Putor’s powers remain unrevealed, but exposure to the mists changed his appearance, giving him yellow skin and a set of bug-like antenna that protruded from his forehead. Tutor was a willful little guy and his mother was often worried that his sass-mouth was going to get him into trouble.